Should signs be serious or silly? Tortoises with ipads on their backs is a strange idea, and its getting the attention of animal rights activists. 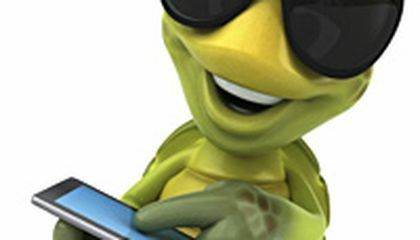 The turtles do not seem to be phased by the ipads on their backs, and in fact, their shells are strong, so the ipads shouldn't affect them. Small box turtles can survive a dog chewing on their shells, then a large tortoise can carry an ipad. I believe this is a sort of animal abuse.Despite they are giving them the best treatment.They are using the tortoise's as entertainment and looking at the picture it seems as if they have it drilled in their shell.It could very well also be uncomfortable to the tortoises,but,I like the fact that they will put them back in the wild and will not have them captive forever.The one thing that stood out to me was the fact that they are using these animals for entertainment it practically makes me sick. I agree with Lisabeth Oden these animals shouldnt be a used to show as "art" they are ment to live a peaceful life not with contraptions on theeir backs. if they were rescuded they should be resting not being a tool to atract people to the museum. I think this is cruelty to these animals because it could hurt them. A good thing is that it will be over by October 5th. The thing with the IPads on these animals back is a bad thing I think. The interesting thing is that they weren't designed to carry a 2 pound IPad, and they are making them. I agree that this is not art. This is animal cruelty. 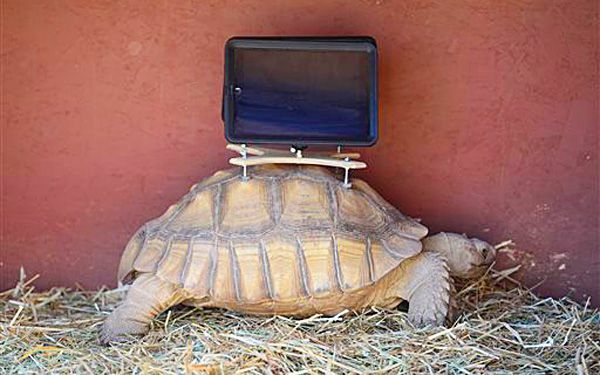 I do not see the point in mounting iPads onto a tortoise just to show a video about "moving ghost town." This video can be put online and sponsored, or even showed on TV so people can know what is going on. I believe that these tortoises were rescued from a breeder just to be put through more pain. Just because Dr. Elizabeth Kremzier says that "The iPads have not interfered in any way with their natural behavior", doesn't mean that in wont effect them in the future. These tortoises should be released back into their natural environment or be taken to new home right away. In response to "Is It Art, or Animal Cruelty?," I agree that mounting iPads on tortoise's backs is animal cruelty. One reason I agree is that tortoises are not bred for having two pound iPads mounted on their back. Another reason is that it must be very uncomfortable and bothersome. It says in the article that the exhibit is closing in October. If the iPads won't be on long, then why mount them on in the first place? A third reason is that they can not be tortoises. The iPad limits them greatly. Also, I don't get why they need to see ghost towns on the tortoises back. This does not make sense to me. Despite the fact that it is animal cruelty, the article states that they are being closely monitored, cared for, checked by a local veterinarian at regular intervals, and are being exhibited in consultation with the Turtle Conservancy, so I know they are in good hands. I believe that mounting two iPads onto three turtles back is cruel.It's against their nature.Why couldn't you just put the videos about ghost town on a television,mounted on the wall,not a cute little turtle! How would this at all be art.Art is anything that is creative,but this isn't art,this is just cruel and unnatural.In the end I hope they will remove the two mounted Ipads. At the colarado art museuem featuring three tortoises with ipods an their backs animals rights called off the exsibit saying its animal cruelty.they are saying that the tortoises were rescuid and vegitarians are overseeing their care. A Colorado art museum was recently accused of animal cruelty thanks to there rather interesting pieces of art that involves I-pads on top of tortoises backs. Now despite the fact that the two pound devices cause no harm whats so ever to the Animals like always there is a whistle blower group attempting to prove that they stand on animals rights by taking action into something that no Action needs to be taken. Also the Ipads work as trackers just in case they are stolen or there seems to be a change in action, And for the art side of whole thing the iPad plays a video of a ghost town. According to the article this museum is making these turtles carry these i pads on their back or absolutely no reason. I mean come on if it was a human with a 50 lb TV everybody would be saying human abuse. But for the turtles its no big deal. I say that place should let those turtles roam and be free instead of making them walk around with these stupid i pads on their backs.